Growing challenge • Flames have charred more than 40,000 acres; About 1,000 firefighters were on the ground as of Saturday. Chris Detrick | The Salt Lake Tribune Helicopter crews work to put out the wildfire burning north of the southern Utah ski town of Brian Head Tuesday, June 20, 2017. The Brian Head Fire -- which forced the evacuation of about 750 residents and visitors on Saturday -- was started by someone using a weed torch in dry conditions, Gov. Gary Herbert tweeted Tuesday, ahead of a 1 p.m. news conference. 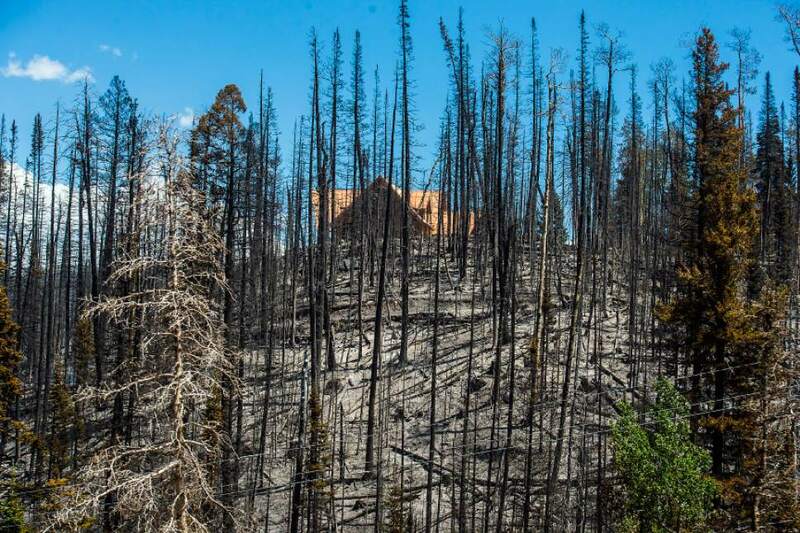 Chris Detrick | The Salt Lake Tribune An unburned structure near the wildfire burning north of the southern Utah ski town of Brian Head Tuesday, June 20, 2017. The Brian Head Fire -- which forced the evacuation of about 750 residents and visitors on Saturday -- was started by someone using a weed torch in dry conditions, Gov. Gary Herbert tweeted Tuesday, ahead of a 1 p.m. news conference. 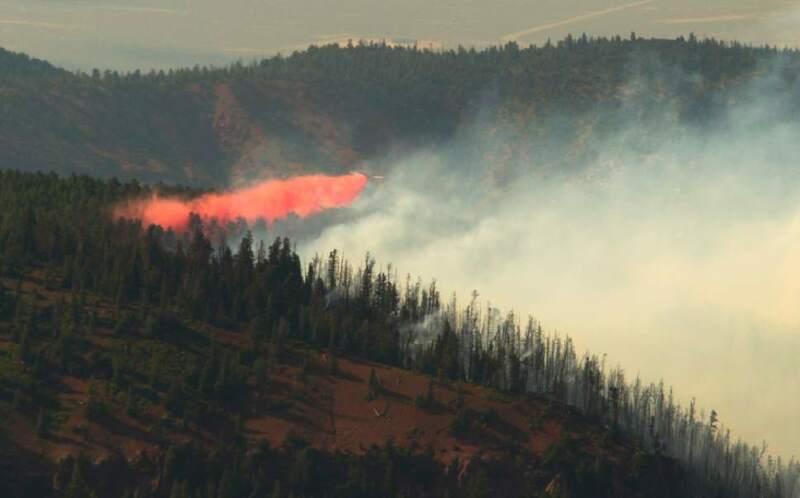 Rick Egan | The Salt Lake Tribune A plane drop fire retardant on the Brian Head fire, as it continues to burn north of the southern Utah ski town of Brian Head, Wednesday, June 21, 2017. 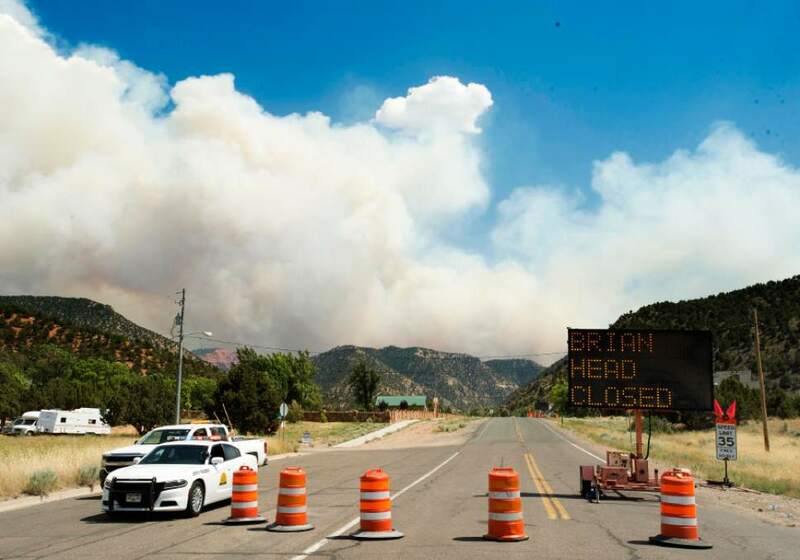 Rick Egan | The Salt Lake Tribune Smoke billows in the afternoon winds behind the roadblock closing highway 143 to Brian Head, in Parowan on Wednesday. Chris Detrick | The Salt Lake Tribune Smoke rises from the wildfire burning north of the southern Utah ski town of Brian Head as seen from Parowan Tuesday, June 20, 2017. The Brian Head Fire -- which forced the evacuation of about 750 residents and visitors on Saturday -- was started by someone using a weed torch in dry conditions, Gov. Gary Herbert tweeted Tuesday, ahead of a 1 p.m. news conference. 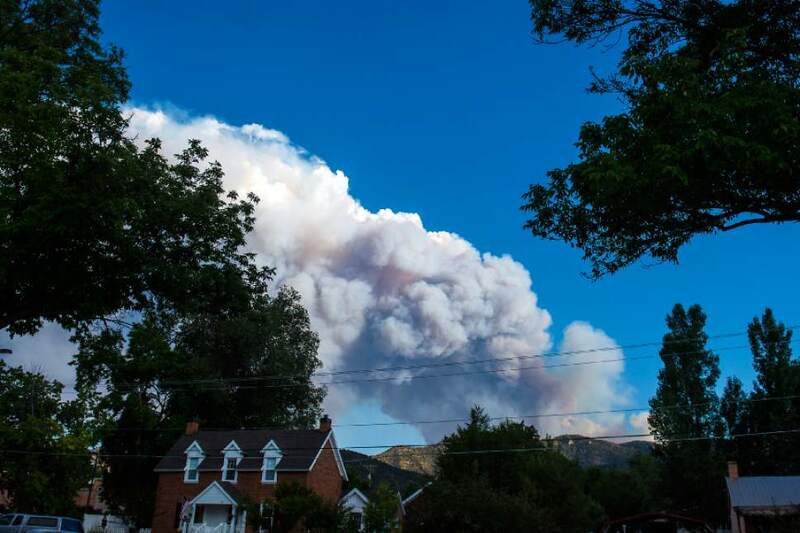 The Brian Head Fire The fire grew to nearly 11,000 acres on Thursday, forcing evac- uations in the Horse Valley, Clear Creek and Beaver Dam areas. 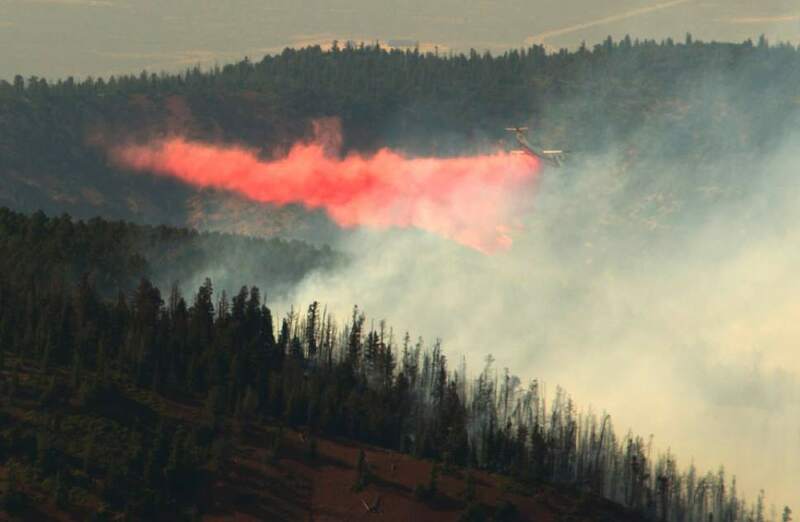 Rick Egan | The Salt Lake Tribune A plane drop fire retardant on the Brian Head fire, as it continues to burn north of the southern Utah ski town of Brian Head, Wednesday, June 21, 2017. Rick Egan | The Salt Lake Tribune The Brian Head fire seen from Panguitch Thursday afternoon, June 22, 2017. Rick Egan | The Salt Lake Tribune The Brian Head fire continues to burn north Steam Engine Meadows, near Brian Head ski resort , Wednesday, June 21, 2017. Rick Egan | The Salt Lake Tribune Officers stop cars heading to Panguitch Lake on State Route 143 Thursday afternoon as the Brian Head approaches. Thursday, June 22, 2017. Rick Egan | Tribune file photo Smoke from the Brian Head fire fills the valley near Parowan, early Thursday, June 22, 2017. 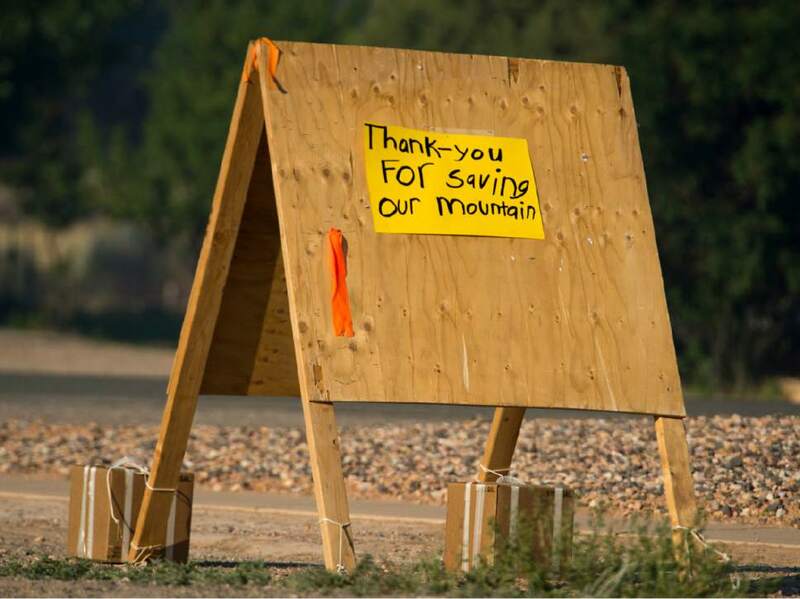 Rick Egan | The Salt Lake Tribune A sign thanking fire fighters in Parowan near the road block to the road to Brian Head, Thursday, June 22, 2017. 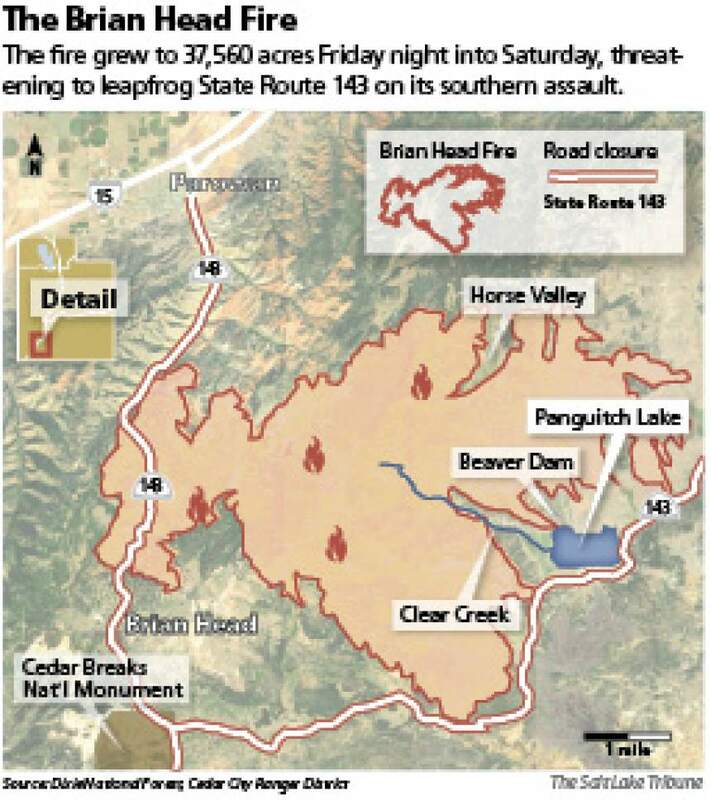 At 40,148 acres, the Brian Head Fire on Saturday night became the largest active wildfire in the country. One week since it began, the blaze continues to rapidly consume timber and brush, with nearly 12,500 new acres burned since Thursday morning, according to Iron County Emergency Management. Some 13 residences and eight outbuildings have been destroyed  including nine cabins burned Thursday night. But no new property damage was reported Friday or Friday night, officials said. The man-made fire was 8 percent contained Saturday night, up from 5 percent Saturday morning. A "red flag" warning was again in effect Saturday, warning fire managers that extreme weather conditions may lead to rapid fire growth. "Continued hot, dry, and windy conditions have hampered firefighting efforts throughout the week," fire officials wrote in a Saturday morning update. "Unprecedented fire behavior has been observed." In the afternoon, winds pushed the fire south across State Route 143, causing spot fires near Mammoth Creek and Prince Mountain, according to a news release. Lighter winds on Sunday will help firefighters, Great Basin Incident Management Team spokeswoman Jesse Bender said. On Monday, however, the winds will pick back up, she said. "That will be a bit more of a concern to us," Bender said. The blaze straddles Iron and Garfield counties in southern Utah. It has quickly spread east and north from the resort town of Brian Head since igniting about noon June 17. 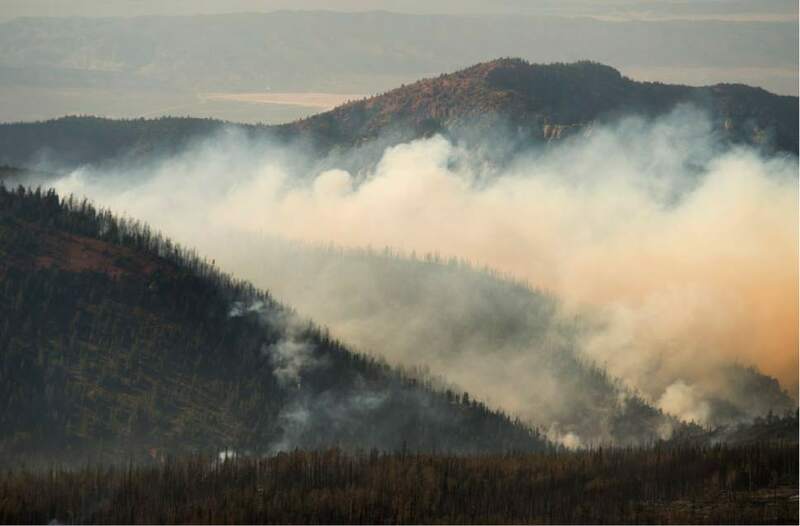 On Friday, the blaze grew significantly to the south, pushing up against SR143 southwest of Panguitch Lake, where several cabin communities are located. A priority would be preventing the flames from hopping the highway and continuing to spread south near the lake, officials said. SR143 remains closed between Parowan and Panguitch. 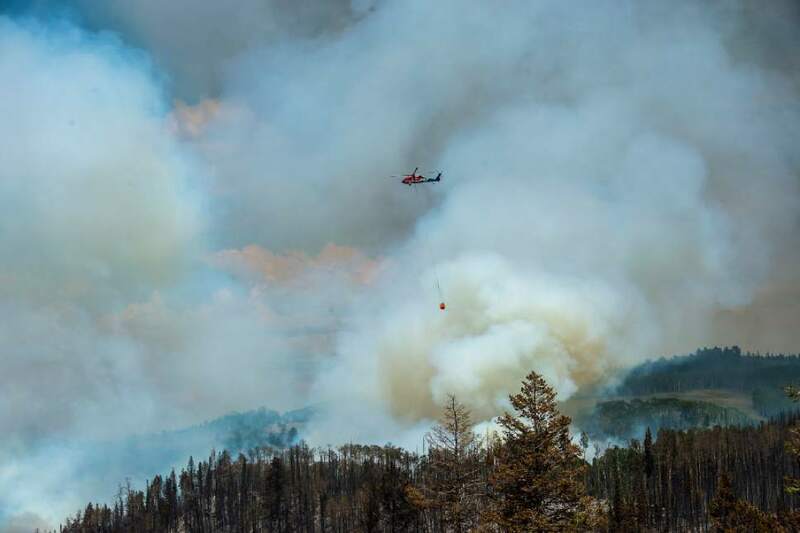 Hundreds have been evacuated since the fire began, including residents and visitors in Panguitch Lake, Horse Valley, Beaver Dam, Castle Valley, Blue Springs, Rainbow Meadows, Mammoth Creek, Dry Lakes, Second Left Hand Canyon and the town of Brian Head. Some portions of the fire were under control. 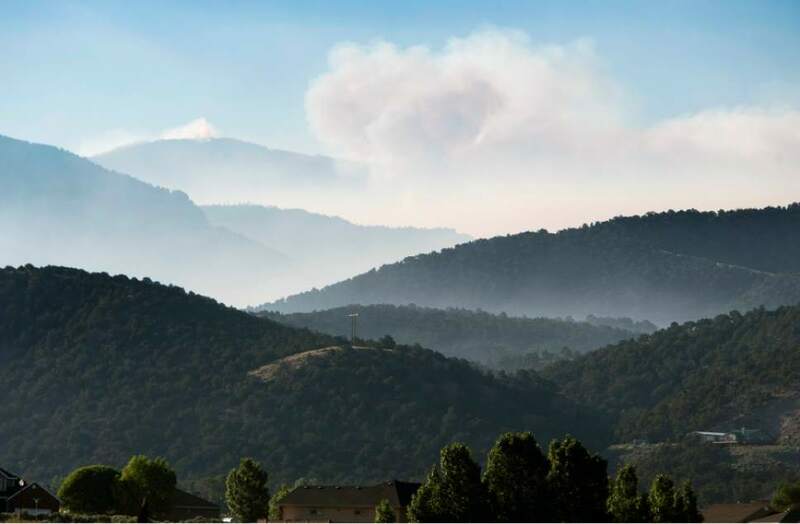 In the southwest corner, firefighters continued to look for hot spots and secure the perimeter "to allow Brian Head residents to return soon," according to the Saturday morning update. The northwest edge of the fire also has grown little, because winds have pushed the blaze back into areas already burned. The northeast corner also was less active yesterday, officials said, as flames reach lighter fuels such as grass and sagebrush. A Type 1 incident management team  a squad with the highest level of experience  was ordered in Friday evening and would join the current Type 2 team. Resources were added to the effort Saturday, including 160 more fire personnel, two more helicopters, one more engine for a total of 996 personnel, 11 helicopters and 41 engines. Because of the size of the fire and the travel time required to get to parts of the blaze, the fire will be divided between the Type 1 and Type 2 teams, Bender said. 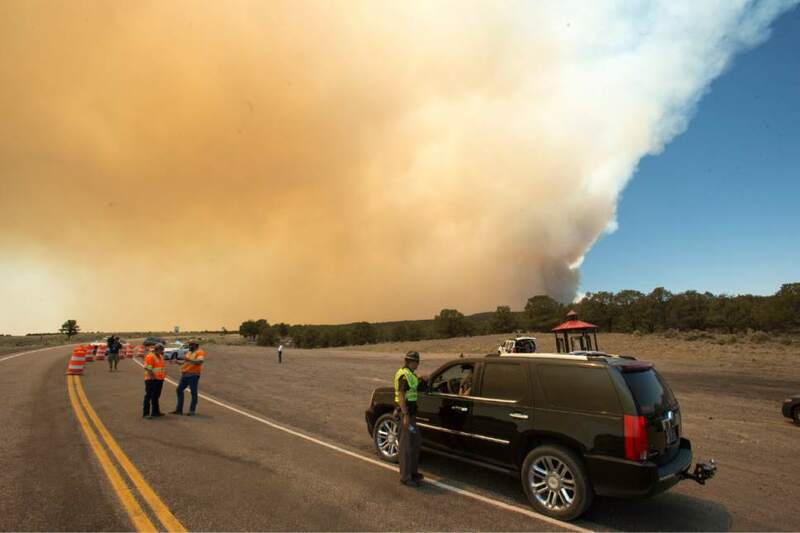 Officials and media were evacuated from a staging area at Lake Panguitch on Friday evening, said Shayne Ward, spokesman for Utah&apos;s Division of Forestry, Fire and State Lands. "The fire was getting a little too close for our comfort, and we wanted to give folks ample time to get out to a safe area," Ward said. The Red Cross was operating an evacuation shelter at Panguitch High School, 390 E. 100 South, for those displaced by the fire. Southern Utah University in Cedar City also offered dormitory rooms to residents displaced by the fire. At a community meeting Saturday afternoon, Bender said, fire officials addressed questions from residents. Some residents were escorted briefly to their homes Saturday, Garfield County Sheriff&apos;s Office spokeswoman Denise Dastrup confirmed, and more may be able to check on their homes Sunday, depending on overnight fire activity. Randy Graham, meteorologist in charge with the National Weather Service&apos;s Salt Lake City office, tweeted Friday that the fire is the largest in Utah since the Dallas Canyon Fire in 2012, which burned more than 43,000 acres. It has also destroyed the most homes since the Wood Hollow Fire took 52 residences in 2012, he wrote. 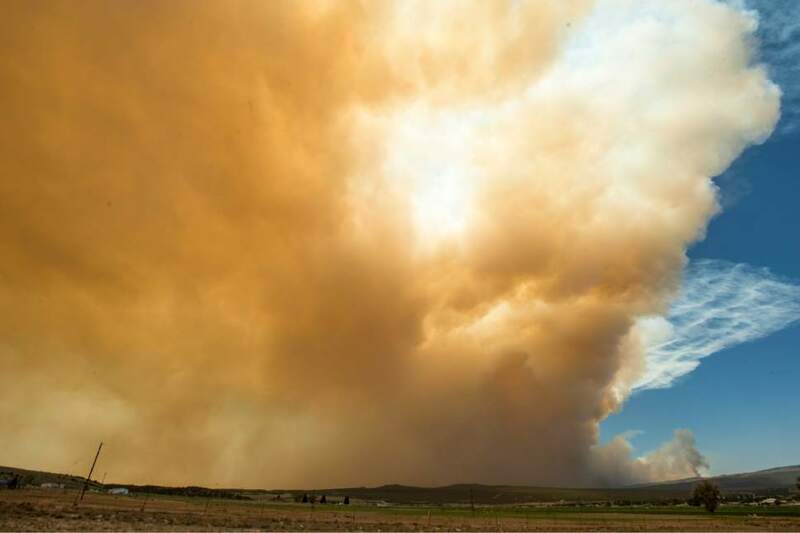 Smoke from the blaze was moving east over much of southern Utah, as well as southwest Colorado and northeast Arizona, weather officials reported. Iron County Emergency Management identified it as the largest active wildfire in the nation. Officials estimated it won&apos;t be fully contained until July 5.